With its release of the revamped Flickr 3.0 iOS app on Thursday, Yahoo continues its push to bolster the photo capture, storage and sharing service by adding features already on competing apps like Instagram. The most apparent change to Flickr in version 3.0 is the redesigned UI, which now displays photos in an easy to navigate grid instead of the previous timeline-style design. With the new layout, scrolling is much smoother and users can easily chew through hundreds of images in short order. As with many other recent iOS app updates, Flickr now sports a "flat" aesthetic with heavy use of transparencies, borderless buttons and layered graphical effects. For example, the app's live filters, which can be previewed before and after taking a picture, now show up on floating cards to add to the UI's depth. Version 3.0 also lets users capture up to 30 second's worth of high-definition video, which can be edited using Flickr's impressive suite of adjustment tools like exposure, contrast and color levels, among others. The aforementioned live filters may also be applied to video recordings. Yahoo's improvements on the backend are worth noting, especially new object-recognition capabilities in photo search. This feature adds to the usual time, date, location search filters seen in most other photo aggregation and sharing apps. Since last year, users of the service can upload 1TB of photos and video to Yahoo's servers for access via the Flickr iOS app or Web client. The Auto Sync feature has been extended to include HD video with the the latest release. 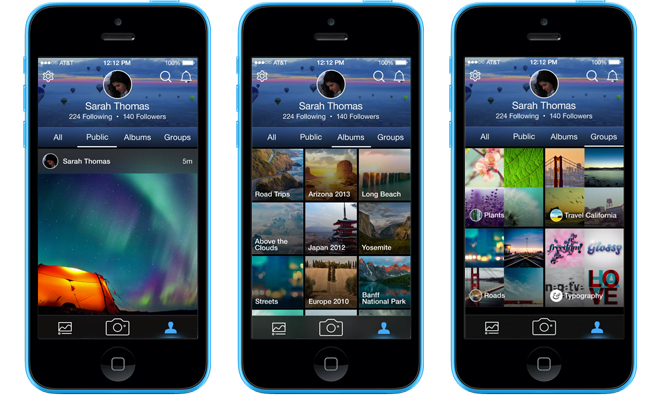 Flickr version 3.0 is a free 41.2MB download from the App Store.